Yajna means a sacrifice or sacrificial rite. It is derived from the root word, yaj, meaning to sacrifice, to worship, honor, revere, or offer an oblation to the gods. The tradition of making offerings to God and worshipping them in a sacrifice of food and other materials is not unique to Hinduism. The Zoroastrians also follow a similar practice which they call yasna. Yajnas are not simple methods of worship, which anyone can perform. They have to be practiced strictly according to the Vedic injunctions and established procedures. Hence the services of a priest are invariably required in performing them. However this rule does not apply in case of daily sacrifices performed by the higher caste Hindus in their households. Yajnas can be performed outwardly in a ritual form to appease the gods and nourish them or they can be performed inwardly and mentally within one's own mind. The latter qualify as internal sacrifices (antar-yajna). Symbolically and spiritually everyone actions performed as an offering to God or gods without desiring their fruit qualify as a act of sacrifice and worship. From this perspective, pursuit of knowledge for liberation qualifies as knowledge sacrifice or jnana yajna. In ritual sacrifices the use of fire is a must. The Vedas mention over 400 yajnas, most of which are not performed presently. A pious Brahmana is expected to maintain three domestic fires in his house and make daily offerings through them. Each of these domestic fires has one or more specific names such as garhapatya, ahavaniya, and agnihotra and is meant for specific types of sacrifices. For example garhapatya fire is the central domestic fire. No offerings should made in it directly. Its fire should be used to lit other two domestic fires, where offerings can be made. According to the Vedic beliefs offerings made in a sacrifice are first accepted by fire god, Agni and he distributes the offerings to other gods according to their fixed share. All gods participate in a sacrifice whether they are invoked particularly or not. The purpose of Vedic sacrifices is world welfare. Through yajna, human beings are able to obtain the blessings and support of the gods to fulfill their desires. However, the gods also depend upon yajnas because they are the only means by which they receive food and nourishment. As stated earlier, some yajnas are performed daily, while some are performed occasionally. 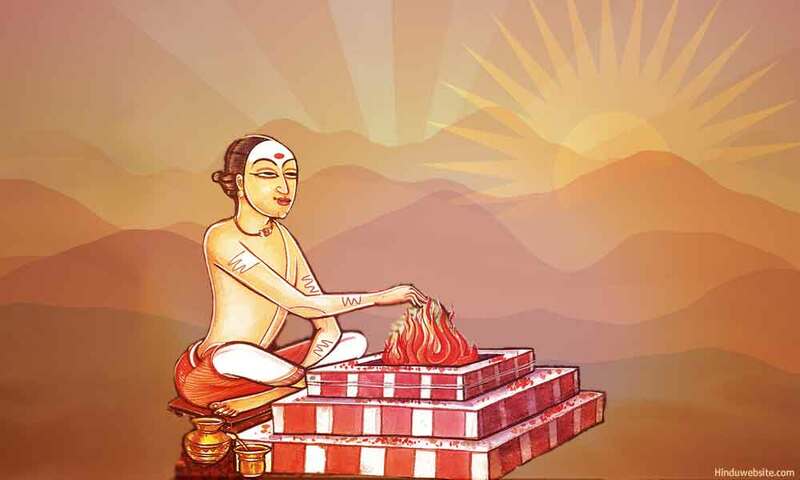 The daily yajna are usually five: offerings to gods (deva yajna), offerings to ancestors (pitr yajna), offerings to other human beings (manushya yajna), offerings to other living beings bhuta yajna) and offering to Brahman or the highest God (brahma yajna). They are also called five great sacrifices (maha yajna). A lot of ritual terminology is associated with the yajnas. The canopy where a yajna is performed is known as yajnasala. The technical name given to the act of performing sacrificial ceremonies is yajati. The act of sacrifice in general is called yajanam, the host of the sacrifice is called yajamana, the sacrificial formula or the prayers used in the sacrifice are known as yajus. A Brahman who keeps sacrificial fire is called yajatra. Each sacrifice has parts, called yajna-anga, each often looked after by a particular priest or group of priest. The share of sacrifice apportioned to each god is called yajna-amsa. The Vedas clearly specify, how to set up the sacrificial place, what material should be used for the offerings and how the offerings should be prepared, what types of utensils should be used and which types of wood should be used in their making, when and how the offerings should be poured, and how many people should participate and what roles they should play. Each sacrifice has a beginning, a middle and an end. Often these are performed different sets of priests. Different types of Vedic hymns are used to being, continue and end the sacrifices. Mainly three types of hymns are used, Riks from the Rigveda, Samans from the Samaveda and Yajus from the Yajurveda. These hymns should be changed according to particular meters in specific intonation. A sacrificial ceremony is usually performed a senior priest called Brahman priest. He is supposed to remain silent throughout out the duration of the sacrifice and simply keep an eye upon other priest to notice any errors and rectify them. The Upanishads state that if the Brahman priests breaks his silence during the ceremony, he would injure the ceremony and cause grievous harm. At the end of the ceremony, the Brahman priest also performs expiatory functions to rectify the faults that cropped up during the sacrifice.